Elevator construction was driven by stringent engineering requirements, lending a degree of commonality to the buildings. A few distinguishing details could be noticed, but from a distance you would be hard pressed to determine the builder. When contractors built the accompanying buildings, however, they had free reign to build in a style they could call their own. Often the scale houses would be instantly recognizable. J. H. Tillotson’s designs lent themselves well to the addition of a stylish scale house built alongside the main elevator. In some cases, when visiting an elevator, our access was limited. 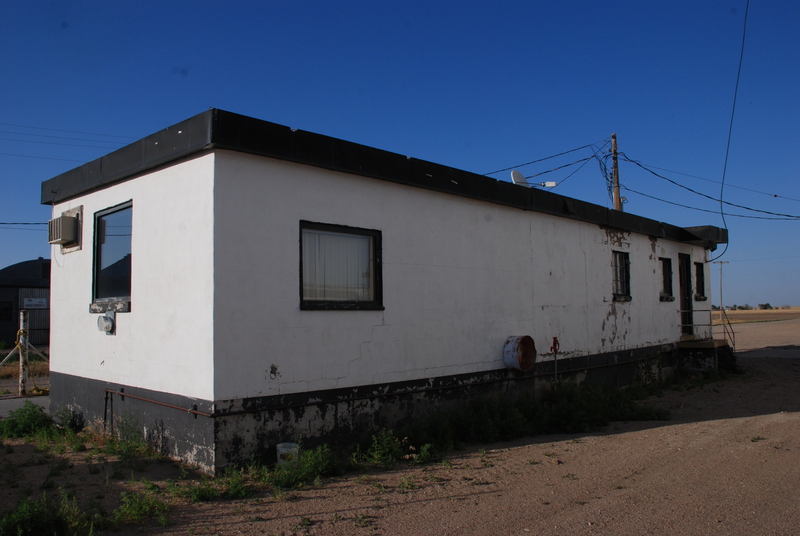 Then the lines of the scale house would be the only clue that we were looking at a J. H. Tillotson elevator. Below are a few examples, each adapted to its individual setting, but each showing some distinguishing details that were common to all. Each J. H. Tillotson scale house was built of concrete, with a rectilinear floor plan. Usually they incorporated a protruding bay window, on the side facing the scale, for added visibility. 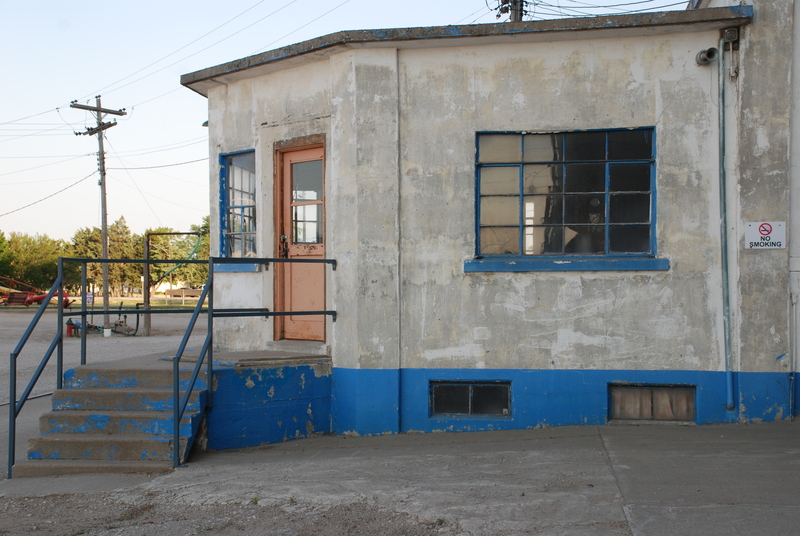 Stairs, usually with steel railings, led to a door to accommodate truckers’ entry into the building. Carefully executed details in the concrete expressed the architect’s personal sense of style. While the builder of the elevators at McAllaster and Bradshaw has not been established with certainty, a fair case can be made that they were J. H. Tillotson designs based on details of the elevators themselves, the driveways, and the scale houses, when compared with known elevators. The scale house at Daykin, Neb., is included here for comparison. J. H. Tillotson’s designs were visually appealing, with scale houses that contributed to a harmonious whole. When considering a builder, buyers would judge the quality of the elevator by its beauty, among other things. In this regard, J. H. Tillotson, Contractor, was more successful than most. Daykin, Neb., scale house built by J. H. Tillotson, Contractor. 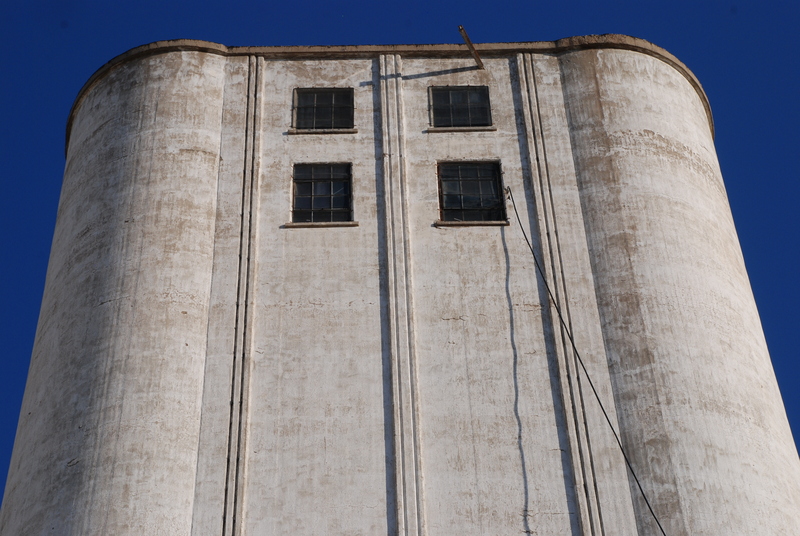 An often unnoticed feature of every grain elevator is the scale house. 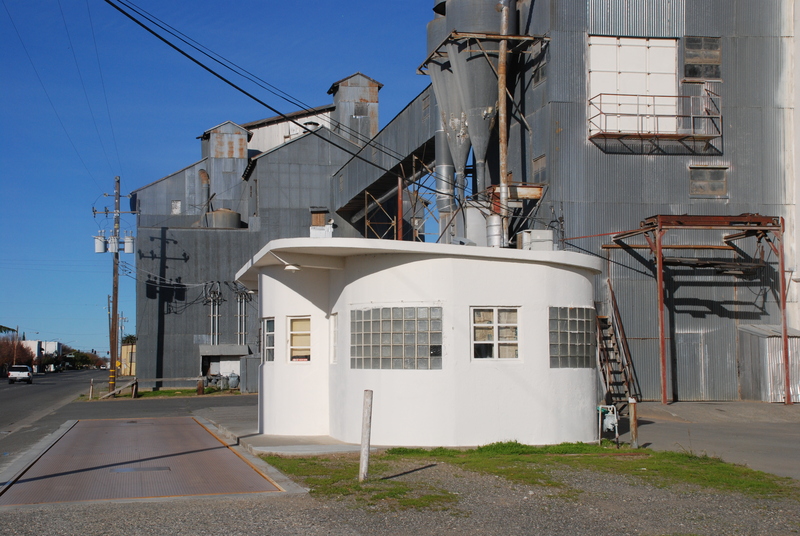 The scale house is home to the cooperative site office, and is the place where the elevator conducts its primary business. 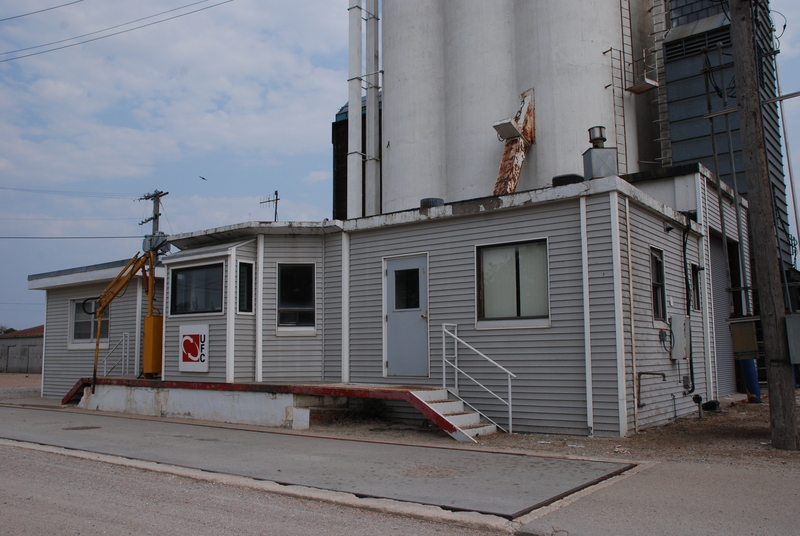 It is usually an unassuming building where empty grain trucks pull up to be weighed before filling up. 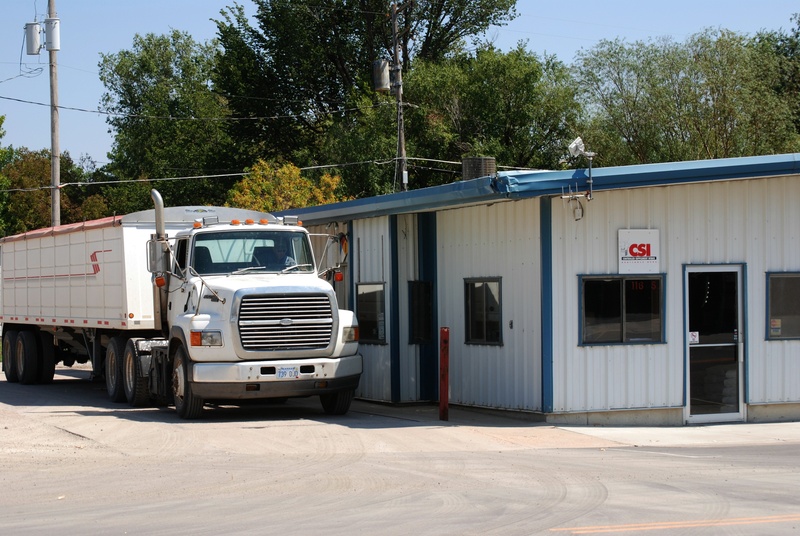 The trucks make a second visit when laden with grain, and the difference in weight is tallied in the office. Conversely, when a full grain truck pulls up to deposit its grain, it must return after unloading to determine how much has been loaded into the elevator. Inside the scale house, a small sample of the grain is tested for quality and moisture content. The scale house in Benton, Kan. Many scale houses are metal or brick buildings, often unattached to the elevator and some distance away. Most are unremarkable. But some of the old concrete scale houses have unique charm. The scale houses that accompanied J. H. Tillotson elevators were particularly attractive, and are one of the first things to look for when identifying their elevators. Scale house in Willows, Calif.
Other builders also produced some remarkable scale houses. Elevator building was driven by engineering and economical constraints, but in some cases the scale houses received special attention. 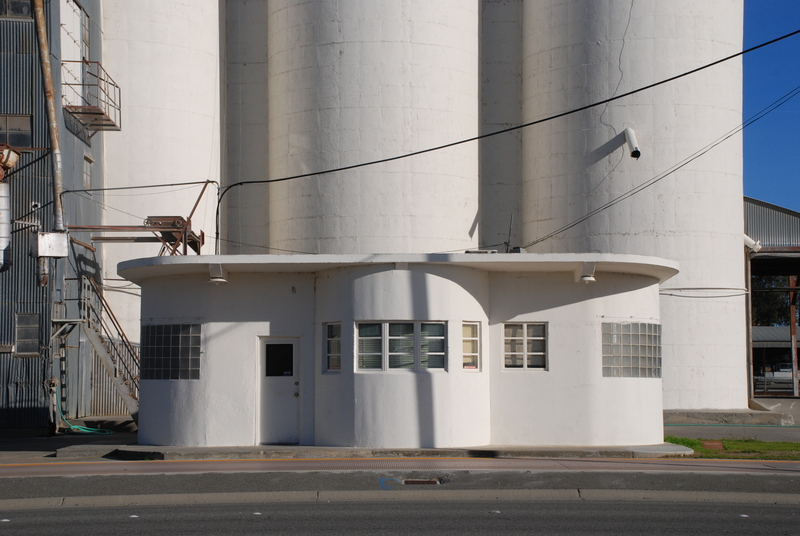 In Willows, Calif., I photographed an example that had to take first prize. This dandy building recalls a 1960s drive-in burger joint, complete with car-side speakers and root beer floats. While it is not an example of our grandfathers’ work, it deserves notice. The simple lines of the back of the scale house at Kanorado, Kan.
Joseph H. Tillotson developed a characteristic style for the scale houses his company built. Those I have visited appeared to be concrete, and many had attractive details. For more typical examples of his work, stay tuned. 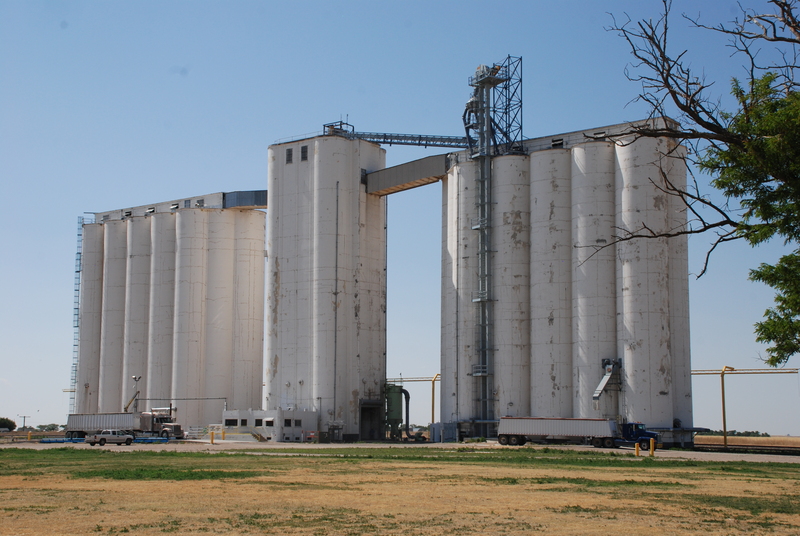 One of the best stops on my elevator tour last October was Kanorado, Kan. It was a fortuitous visit, made in the golden hour of photographic light. We have profiled the elevator before, based upon a visit by Gary Rich while the elevator was operating and open for an impromptu tour. But I wanted to see for myself the elevator my grandfather William Osborn built. No one was there when we arrived, but I was able to get a good look at all sides of the structure. The straight up, classic lines were unique to J. H. Tillotson elevators. Other companies built similarly styled elevators, such as the Greenwood, Neb. elevator built by Tillotson of Omaha in 1951. But those differed in shape and concrete detailing. 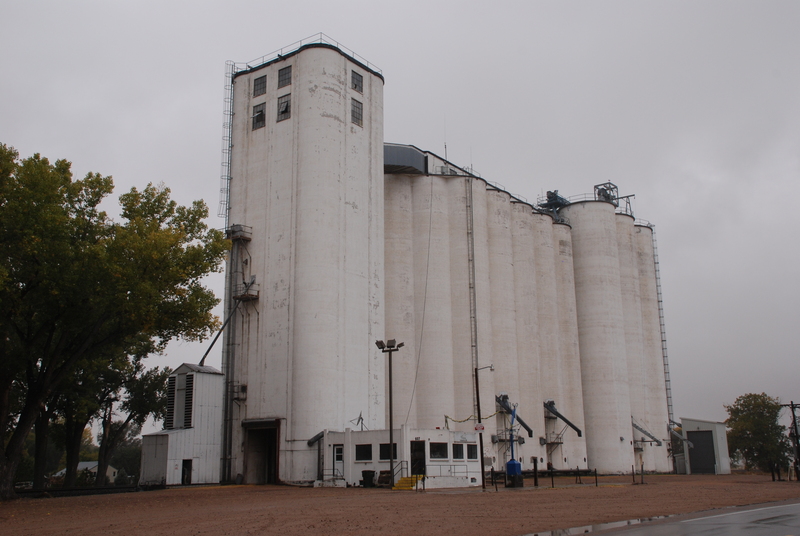 The elevator at Kanorado was an earlier effort, and should be compared with those at Traer, Kan., Goodland, Kan., and Wauneta, Neb., among others. 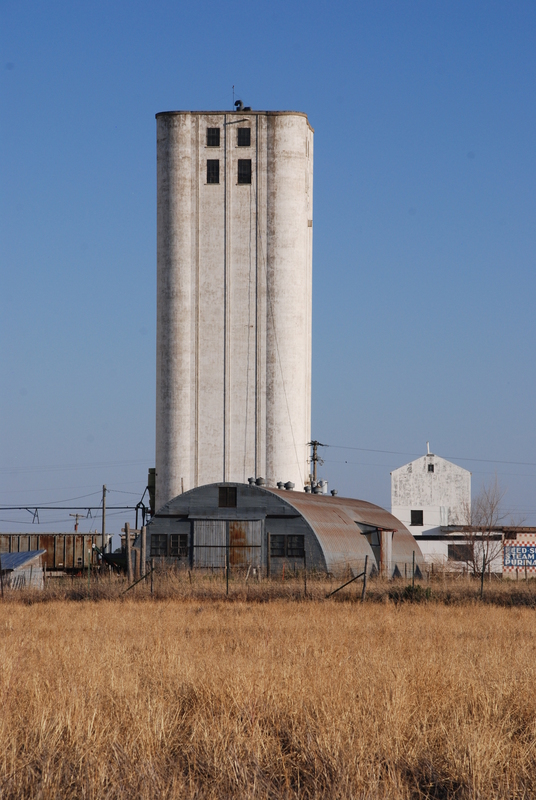 Another design element that seems to be unique to Joseph H. Tillotson’s Denver-based company is the squat concrete scale house, a deceptively simple building with lovely proportions, as can also be seen with the J. H. Tillotson elevator at Daykin, Neb. It is good to see another 1940s vintage elevator still doing its job nearly 70 years later. It is a testament to a work ethic that seems quaint in our present day, and a personal investment in quality beyond the next payday. My grandfather would be proud. My uncles Tim and Charles Tillotson have put their heads together and come up with a list of supervisors who directed operations on Tillotson Construction Company jobs. What follows are Uncle Tim’s notes, and we’ve done the best that we can in regard to spelling. 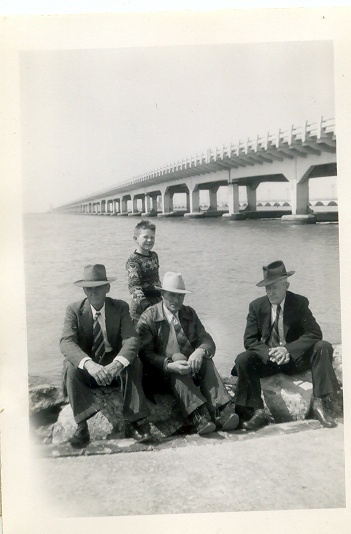 Jerry Osborn (standing) with his father Bill Osborn (center) and Iver Salroth (right) in Galveston, Texas in 1945 during construction of Tillotson’s Fairmont building in Giddings. 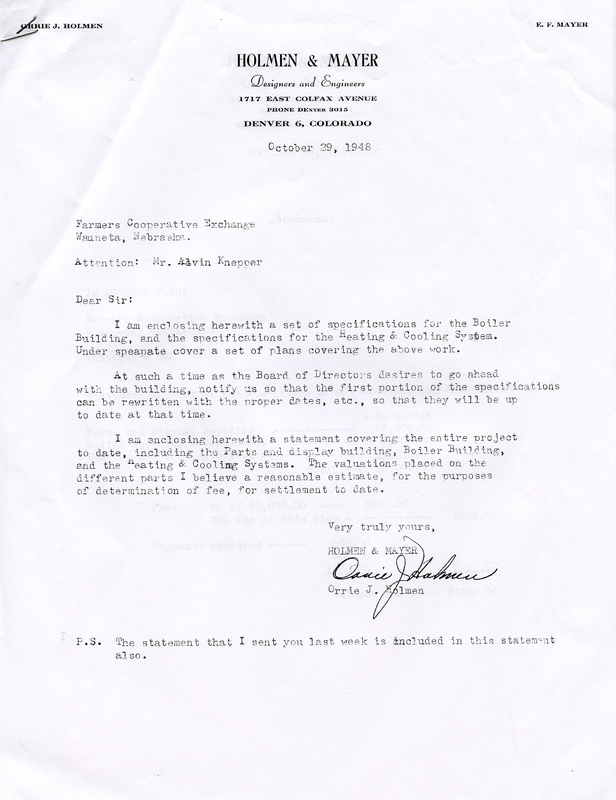 We have very limited information about the activities of Tillotson Construction of Omaha during World War Two. 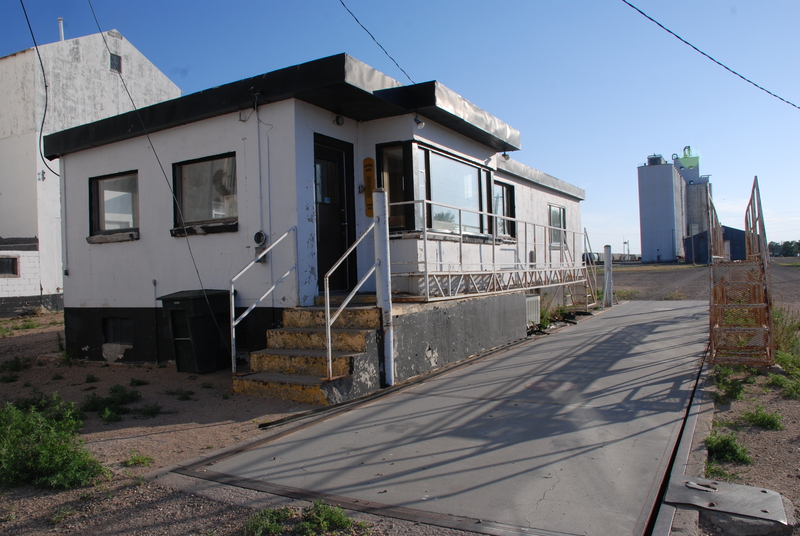 The other two elevator builders we profile, J. H. Tillotson, Contractor, and Mayer-Osborn, of Denver, Colo., began their operations after the war, but individuals working for both companies gained their experience during wartime, either at Tillotson Construction, or elsewhere. Eugene Mayer, a partner in Mayer-Osborn Construction, previously worked in a partnership, Holmen and Mayer, based in Denver. Orrie Holmen was a University of Chicago-trained architect. 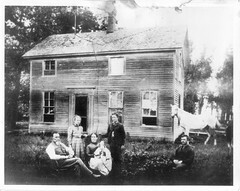 Eugene’s sister Sheila was the wife of Joe Tlllotson. At some point after 1938, Joe left his brother Reginald in charge of the parent company, Tillotson Construction, of Omaha, and moved to Denver to start his own elevator business, accompanied by old Tillotson hands William Osborn and Bill Morris. It would be fascinating to trace the wartime activities of each of these principal builders, if they can be learned. In the Tillotson company records, we found concrete elevator specifications beginning a few years before the War and resuming immediately afterward, but conspicuously absent were records of elevator construction during the War. 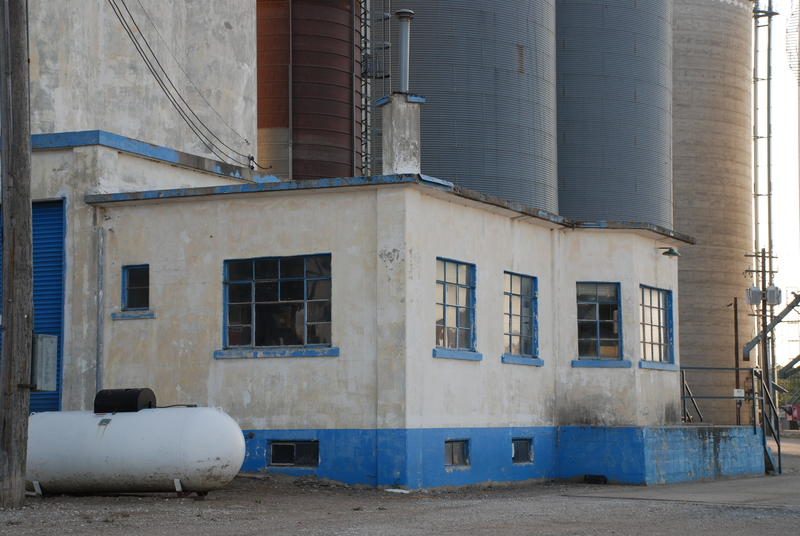 However, we know Tillotson Construction was active between 1942 and 1945. We found one snippet in an old newspaper, which we transcribed on the blog: https://ourgrandfathersgrainelevators.com/2012/05/08/nebraska-firms-get-government-contracts/. When we learn more about the activities of the company during that time, we will certainly write about it here. It is an open line of inquiry, and we are eagerly seeking more information. 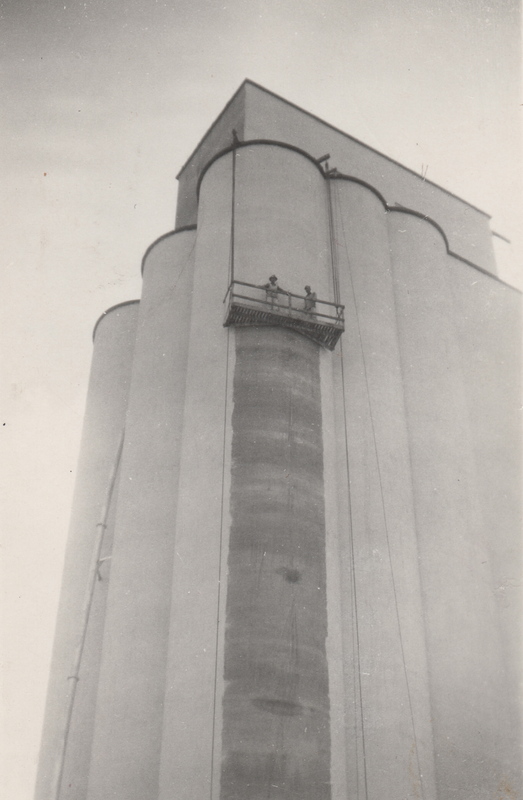 This photo from the Tillotson Construction Company archives shows two painters on a flying scaffold at an undetermined elevator. When Michael and I started work, all the concrete pouring was complete and we were given the task of painting the outside of the whole elevator. We painted it using a lime-base whitewash. We had to crawl over the edge of the top of the tank onto a flying scaffold. The scaffold was held up by a pair of rope block-and-tackles connected to a pair of wood beams that were extended about two feet over the edge of the tank. The wood beams extended about ten feet inboard and were weighed down with sandbags to keep the scaffold from falling. The scaffold was made up of a pair of two-by-twelve boards with a metal frame at each end and two-by-four railings around it. The rope block and tackles were attached to the scaffold on the ground. We had to pull the scaffold up to the top every time for each ten-foot width we painted. There was an old man on the ground who mixed the paint and pulled it up to us in a five gallon bucket. He had a harder job than we had. All we had to do was brush on the paint and pull the rope to release the half hitch that held up the scaffold and let gravity work to lower it. The “flying” part of flying scaffold was when the wind was blowing. You would fly halfway around the tank. 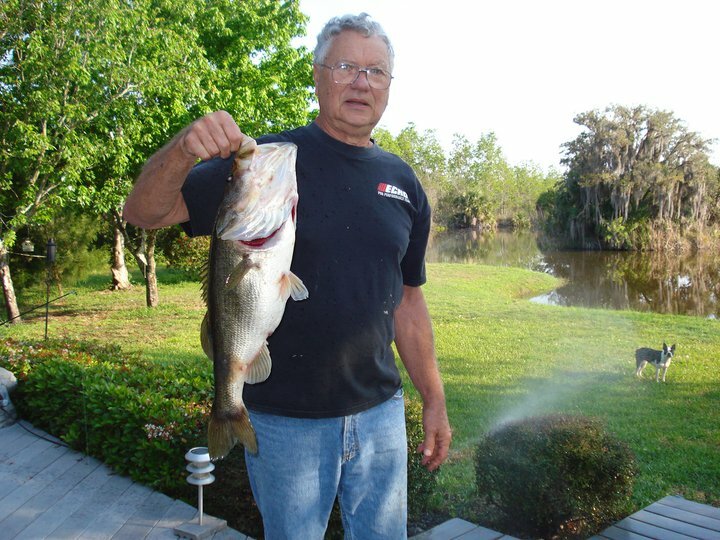 Merle Ahrens in 2011 at his home in Titusville, Florida. Every night we would take off our Levi’s and stand them in a corner. There was so much paint on them! Yet one pair lasted all summer. 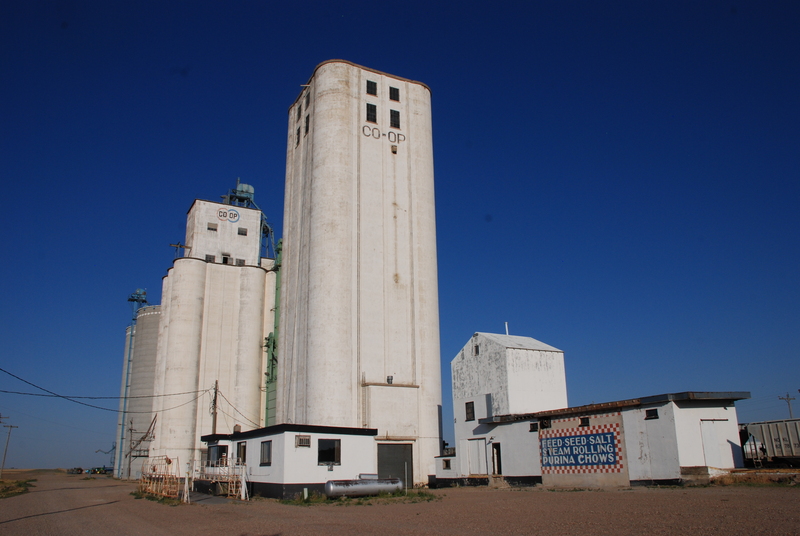 After a couple of months we finished painting the elevator in Lincoln and went to David City to paint another grain elevator. This time we used a new latex paint. It was very slow-drying and the wind kicked up a lot of dust. The elevator ended up white with grey stripes. We kept hearing of accidents at other sites. One man [Larry Ryan]was said to have fallen from a plank used to walk between the tops of two tanks. He was wearing new boots and slipped. Another was killed when roofers removed the sandbags holding the beam for the flying scaffold so they could hot-tar the roof. A couple more were hurt while riding on a bucket and the clamps holding the cable slipped. The clamps were installed wrong. I do know for a fact that one worker at Lincoln was hit in the face when a five-gallon bucket with concrete in it fell while he was using a rope and pulley to lift it overhead. Uncle Tim Tillotson recalled the challenge of painting while the scaffold flew back and forth in the wind. “When you’d come back you’d get a few licks in with the brush,” he said. 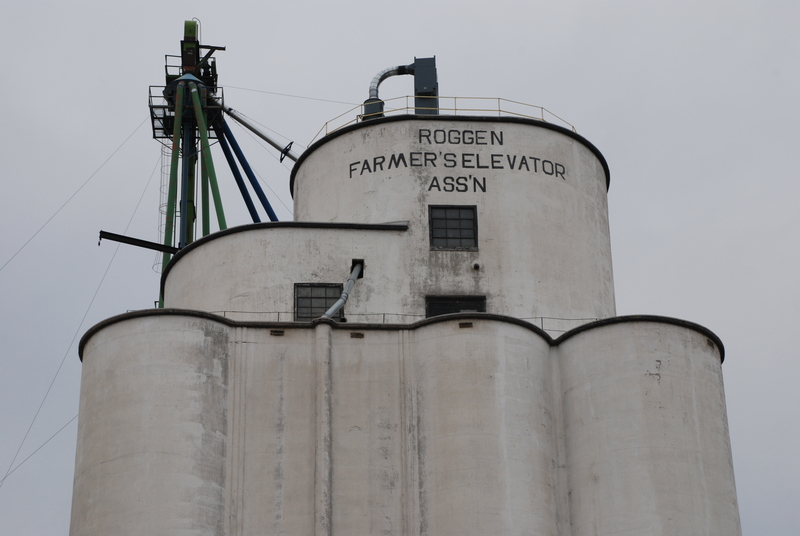 The Roggen, Colo., elevator has the typical Mayer-Osborn stepped-up headhouse. 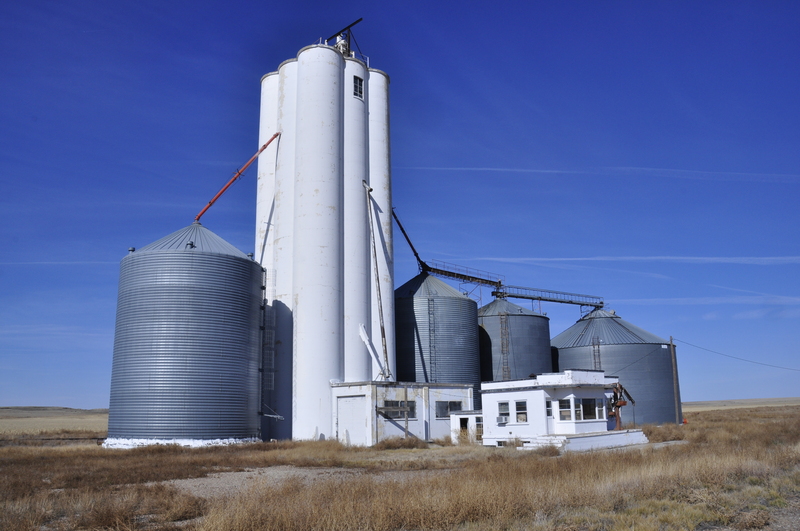 The stepped-style headhouse on the 1950-vintage elevator at Roggen, Colo., raised our suspicion that Mayer-Osborn Construction built the elevator, and that my grandfather William Osborn had a hand in it. Our hunch proved to be right. 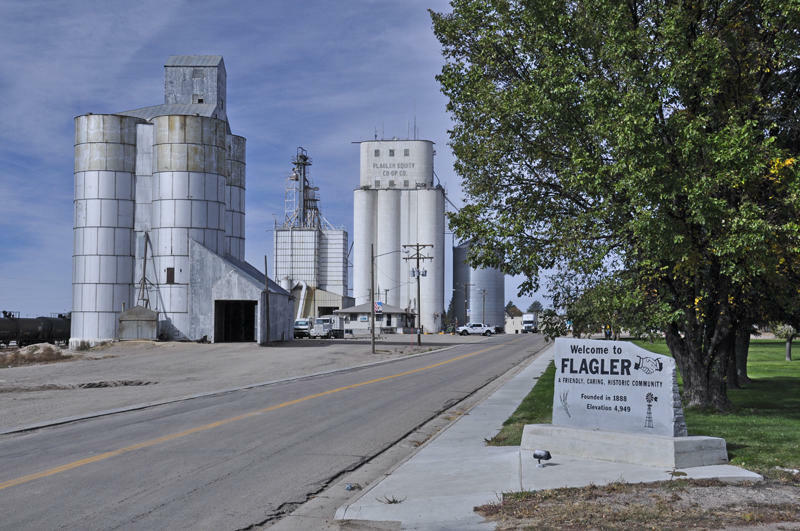 A 1950 newspaper account detailed its construction, as well as that of the concurrent project at Byers, Colo. Roggen’s elevator was built on the heels of its twin, the Mayer-Osborn elevator at McCook, Neb., which was completed the year before. 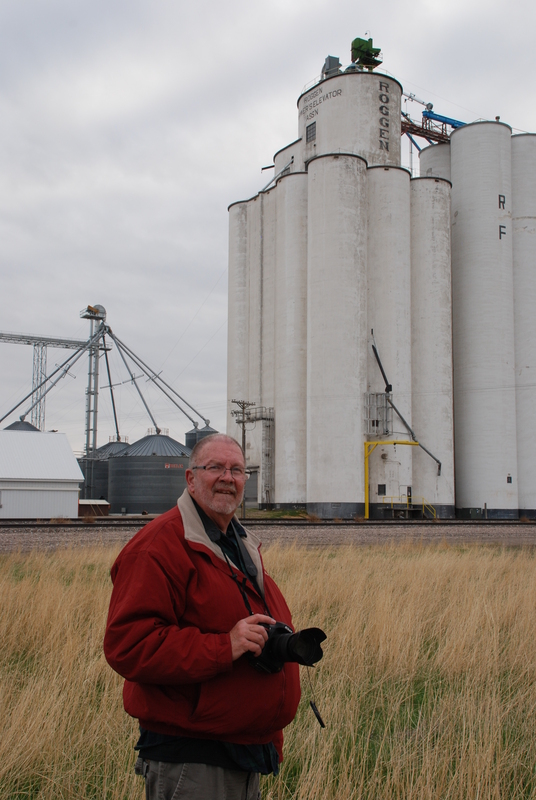 Gary Rich explores creative possibilities at the Roggen elevator. Last year Gary Rich, contributor to this blog, paid a visit to Roggen. He documented the manhole covers inside the driveway, which bore the company name in raised letters across the top of the steel plates manufactured by Hutchinson Foundry. After seeing his photographs, I was very eager to see the elevator for myself. Last fall on a visit to Colorado I met with Gary, and we took in Roggen and Byers among other elevators on a photography tour. Roggen is fairly accessible and located just east of Denver. The purpose of our tour was to document the elevators, but also to inject some creativity into the process. The results were very pleasing, especially at Roggen. This is part two of our photo tour. When I started looking for my grandfather’s elevators, I never suspected it would open the door to the elevator photography and historical research you find in this blog. Best of all, our contributors Ronald Ahrens and Gary Rich have made this project great fun for all of us. I hope you, our readers, get a kick out of it as well, and are inspired to follow your own quests wherever they may lead. 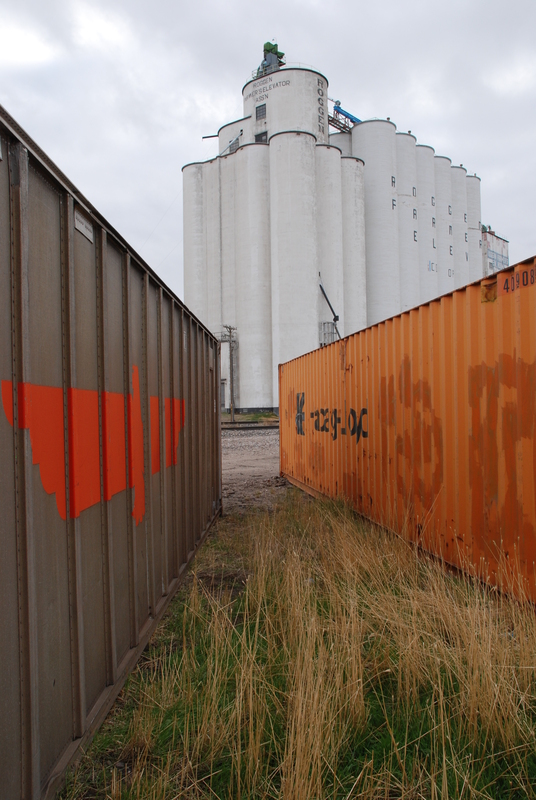 Empty containers frame Roggen’s 1950 elevator.